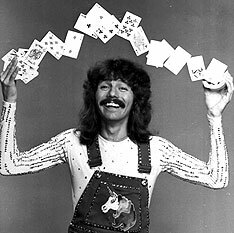 I couldn't stop thinking about ole Doug Henning after my blog the other day so I thought I'd share with my readers some of Doug's 'gifts' or contributions to magic. 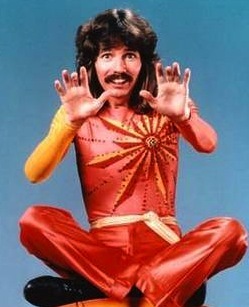 There are a number of effects that are instantly associated with Doug Henning. 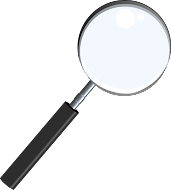 The top of the list: Sands of Egypt, Things That Go Bump In The Night, Metamorphosis, The Water Levitation, Double Sawing, Mis-made Lady, and more. You'll notice that many of these have links. The links are too Youtube videos of Doug performing those particular effects. ZIG-ZAG Lady. Today this trick is rarely seen because it was so overdone in the 1970s and 80s. It was the creation of Robert Harbin and Doug built his career with this prop. It was in his Broadway show The Magic Show and he toured with it. 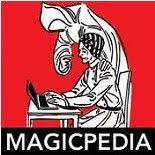 When it became a popular illusion for other magicians, he replaced it with other routines. The Sands of Egypt. This is the effect where three colored sands are dissolved in water and then removed completely dry. It's a great effect and certainly associated with Doug, but he didn't create it, nor was he the first to perform it. The trick dates back pretty far. To give you an idea of some others who presented the effect: Charles Bertram, Eugene Laurant, and Jack Gwynne just to name a few. Things That Go Bump In the Night was actually the creation of Servais LeRoy. His original creation was called "The Three Graces". And the effect was quite similar to what Doug Henning presented. But I think it's safe to say that Doug resurrected that routine and today it's more associated with Henning. Metamorphosis. Before the Pendragons came along, Doug had probably the fastest Subtrunk in the business. As we all know, the effect was Houdini's though the trunk trick itself predates him. The substitution of two people though was all Houdini and many other performers have presented it since. It's become a staple 'starter' illusion for young performers. In Doug's version the first thing that you notice is the condition of the box. It was always beat up and did not look anything like his other props. This was on purpose of course. It just looked like a wooden crate, not a magic prop and this helped sell the routine. Doug's costume change at the end was another bonus, though he was not the first to do that either. But prior to the Pendragon's I think many people associated this prop with Doug. After Jonathan and Charlotte came around, they pretty much owned it. The Water Levitation was Doug's. At least, as far as I know he was the very first to present it. It was basically an older method revamped onto a tall platform and the addition of the water fountain was genius. This was pure Doug Henning. The Double Sawing is a routine that Doug presented on his TV specials and also on a number of TV shows, like the Tonight Show and others. I believe they even created a version of it for the Broadway show MERLIN. I believe the Double Sawing can be credited to Channing Pollack actually. At least that is what my memory is telling me. If I am incorrect, please let me know. Doug resurrected the routine and many other performers since that time have used it. The Mis-Made Lady was a fairly new trick when Doug started doing it. This was a creation of Chuck Jones, but Doug was probably the first to use it on TV and he even created a version using a Giant Muppet Character! Walking Thru A Mirror: This was a Jim Steinmeyer creation and Jim worked for Doug. It's a beautiful trick that was debuted on one of the World of Magic Specials. Origami Box: Yes, Doug was the first magician to present the Origami Box. Another Jim Steinmeyer creation. And sadly, it's been way overdone since Doug's time. The Elevator: Doug was the first to present the Elevator, though he used a method different from what many others are using today. I remember the first time I saw it and it fooled me badly. Another Steinmeyer illusion. The Pole Levitation: I don't know if this ever made it to a Doug Henning Special. But I know I saw him do it on a TV Talk Show and of course I saw it live several times. Another first for Doug and yes, another Jim Steinmeyer creation. The Rube Goldberg Illusion: From what I understand, this was actually Doug's idea. To take the Rube Goldberg puzzle effect and turn it into an illusion. I can't find a video of this one unfortunately. There was a lot of smaller magic that Doug made popular too. The Enchanted Rubiks Cube, The Flexible Mirror or Needle Through Mirror, The Double Dancing Hanks, The Torn and Restored Newspaper and the Vanishing Nickel. The Double Dancing Hanks were a creation of Ralph Adams. The Torn & Restored Newspaper was of course, Gene Anderson and the Vanishing Nickel was John Cornelius's creation. Many of these effects, both small and large are still presented today. There are some things that Doug did that still stand out to me today. His version of Houdini's Walking Through a Brick Wall is one example. Doug also used Houdini's Vanishing Elephant on his second special with a very different method than what Houdini used. Though I think Milbourne Christopher was actually the first magician to vanish and elephant on TV. NO FEET is a great routine created by Andre Kole and can be seen at the end of the Enchanted Rubiks Cube clip that I posted above. Basically, in the NO FEET illusion, the performers feet seem to vanish! One of my favorite Henning routine's was a Ring in Bread routine that he presented in his last tour and on the Tonight Show. This was based on an idea by Orson Welles and Jim Steinmeyer built the effect around it. I can attest to the strength of the routine as I use it myself today. The Jarrett Box is another highlight in my memory. The production of 21 people out of a fairly small cabinet. This was the creation of Guy Jarrett and Doug brought it back to life. I'm not sure if it had been seen since the days of Howard Thurston. Recently, Scott Alexander presented the Jarrett Box on TV producing a Gospel Choir from the box. Apparently, the idea for vanishing the Statue of Liberty was first presented to Doug who passed on it. That idea was then given to David Copperfield and that trick put him on the map so to speak. Another was an illusion called Permeability, which illusionists will know as Interlude. This is the person through person effect first debuted by The Pendragons. Well, I just learned the idea was originally going to be for Doug, but it never made it. Permeability, as well as many of the above effects were creations of Jim Steinmeyer. Yes, Doug appeared in a giant mouse at the end of the illusion. And yes, Lance also had one built, though I only ever saw a photo of Lance's illusion. I have only the last three specials, not the early ones.